August 24, 2010 - U.S Air Force reports pilot error caused the crash of an MQ-1B Predator at Southern California Logistics Airport during an April 20 training mission, according to an Air Combat Command Accident Investigation Board report released Aug. 20. The Predator was an Air National Guard aircraft from the 163rd Reconnaissance Wing at March Joint Air Reserve Base, Calif., operated by members of the 3rd Special Operations Squadron under the supervision of instructors from the 163rd Operations Group Formal Training Unit also based at March JARB. While no injuries occurred as a result of the accident, the aircraft and one inert Hellfire training missile were a total loss. The estimated damage to government property, including a runway light, is valued at about $3.7 million. According to the report, the crash was caused by a student pilot's failure to recognize the aircraft's speed was too low for the weather conditions and aircraft configuration. Insufficient speed during final approach caused a stall from which the student pilot and his instructor were unable to recover. This resulted in a hard landing that exceeded design limitations for the aircraft. Upon impact, the left wingtip dragged on the ground, causing the aircraft to leave the prepared runway surface and subsequently break apart. Unexpectedly difficult wind conditions at the field during the landing contributed to the mishap, officials said. The MQ-1B Predator is a medium-altitude, long-endurance, unmanned aircraft system. The Predator's primary missions are close air support, air interdiction, and intelligence, surveillance and reconnaissance, or ISR. It acts as a Joint Forces Air Component Commander-owned theater asset for reconnaissance, surveillance and target acquisition in support of the Joint Forces Commander. The MQ-1B Predator is a system, not just an aircraft. A fully operational system consists of four aircraft (with sensors and weapons), a ground control station, or GCS, a Predator Primary Satellite Link, or PPSL, and spare equipment along with operations and maintenance crews for deployed 24-hour operations. The basic crew for the Predator is a rated pilot to control the aircraft and command the mission and an enlisted aircrew member to operate sensors and weapons plus a mission coordinator, when required. The crew employs the aircraft from inside the GCS via a line-of-sight data link or a satellite data link for beyond line-of-sight operations. The MQ-1B Predator carries the Multi-spectral Targeting System, or MTS-A, which integrates an infrared sensor, a color/monochrome daylight TV camera, an image-intensified TV camera, a laser designator and a laser illuminator into a single package. The full motion video from each of the imaging sensors can be viewed as separate video streams or fused together. The aircraft can employ two laser-guided AGM-114 Hellfire missiles which possess a highly accurate, low collateral damage, and anti-armor and anti-personnel engagement capability. The system can be deployed for worldwide operations. The Predator aircraft can be disassembled and loaded into a container for travel. The ground control system and PPSL are transportable in a C-130 Hercules (or larger) transport aircraft. The Predator can operate on a 5,000 by 75 foot (1,524 meters by 23 meters) hard surface runway with clear line-of-sight to the ground data terminal antenna. The antenna provides line-of-sight communications for takeoff and landing. The PPSL provides over-the-horizon communications for the aircraft and sensors. An alternate method of employment, Remote Split Operations, employs a GCS for takeoff and landing operations at the forward operating location while the CONUS based crew executes the mission via beyond-line-of-sight links. The aircraft has an ARC-210 radio, an APX-100 IFF/SIF with Mode 4, and an upgraded turbocharged engine. The latest upgrades, which enhance maintenance and performance, include notched tails, split engine cowlings, braided steel hoses and improved engine blocks. The Predator system was designed in response to a Department of Defense requirement to provide persistent intelligence, surveillance and reconnaissance information combined with a kill capability to the warfighter. In April 1996, the secretary of defense selected the U.S. Air Force as the operating service for the RQ-1 Predator system. The "R" is the Department of Defense designation for reconnaissance aircraft. 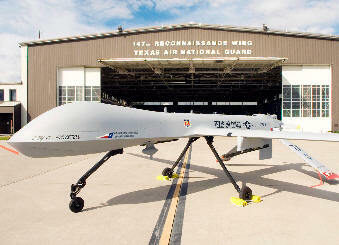 The "M" is the DOD designation for multi-role, and "Q" means unmanned aircraft system. The "1" refers to the aircraft being the first of the series of remotely piloted aircraft systems. A change in designation from "RQ-1" to "MQ-1" occurred in 2002 with the addition of the AGM-114 Hellfire missiles, enabling reaction against ISR, CAS and interdiction targets.